More than 25 years ago, I gave up on pre-printed logbooks and started using ordinary (and much less expensive) spiral-bound notebooks. 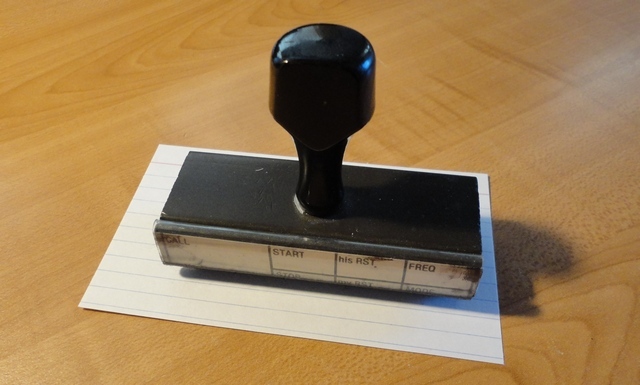 To keep all the pertinent information in one place, I use a rubber stamp that I had specially made at a local stationery store. Here’s the rubber stamp I had made at a local stationery store, sitting on an American 3″ x 5″ card for size comparison. Logbook stamp impression. The stamp is over 25 years old, so it’s gotten a bit fuzzy over the years, but still serves its purpose well. You can see the UTC date in the left margin. I can then record anything I want about the QSO underneath, such as the operator’s name, location, station information, and anything else. I can use as much or as little space as I want. Sometimes, when I’m copying CW, I just copy right into the notebook, and then everything about the QSO is in one place. Then I just stamp again for the next QSO. Nifty, huh? 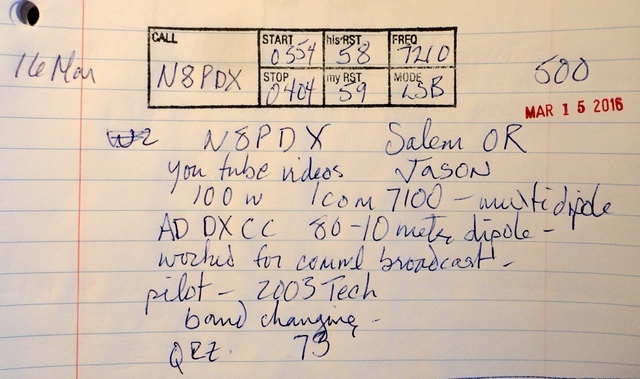 This entry was posted in Ham Radio blog entries and tagged amateur radio logging. Bookmark the permalink. My stamp is about 3-1/2 inches wide. You can scale from there. This is a great idea, do you have any dimensions on the over all size and box sizes? Great idea! Cheaper in the long run than printing all those LOGS. I’m one who prefers to hand-write the info before entering it in a computer database. I just discovered you recently. I am relatively new to Ham Radio. My daughter works with a guy who is a ham and he said I might like this hobby in my retirement. She bought me the Technician Study Manual and I soon discovered that I wanted to earn my General, also. I bought the General Study Manual, and studied both. I took both tests the same day through a local Ham club and passed both exams. I am in the process of building my first base station and have found your videos a great resource. Thanks for your great web site and videos. This is an idiot simple idea and is amazingly handy (especially for the EMCOMM guys; you don’t always have time to get a log book in an emergency). I am not an amateur operator (yet; studying now), but I’ve used this technique for forensic purposes for years. Just make the template, save it in an image format, and you can make a matching stamp. I’ve done several similar stamps, and the place I’ve had the best luck with is rubberstamps.net. The one caveat is that you need to have a good inkpad with you at all times (and make sure to keep it and the spare ink sealed up nice and tight otherwise it could be a real mess, or worse… dry out). Brian, try a local stationery store, or even Office Depot or Staples. Often they can make custom rubber stamps. I’ve had mine for probably 25 years—had it made to order. Good luck! I really enjoy your YouTube channels and find them very informative. I was wondering if you had a source for reproducing your log book stamp? I’d love to have one myself. Yes, I use both eQSL and LOTW. Dave, i love this simple but flexible idea. Have you ever used one on the new electronic methods?